Officials of the Rapid Response Squad, RRS, of Lagos State Police Command have arrested a 22-year-old man who posed as a lady on the social media to defraud unsuspecting victims. 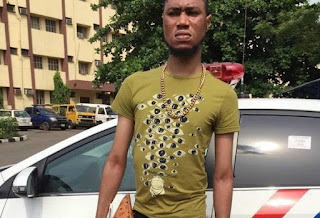 The 22-year-old suspect, Falope Oluwole Israel, who is a part-time student of the Nigerian Institute of Journalism, Ogba, Lagos, was nabbed at the weekend by officials of the RRS decoy team at a popular club in Ikeja City Mall. He was arrested after he celebrated his birthday at Hard & Rock, Lekki, Lagos, where he reportedly lavished over half a million naira on foods and drinks. The suspect, a 100 level part time student, confessed to the crime. Speaking with Vanguard, Israel said he had been in the business for more than two years. In a confession, he noted that since he started the fraudulent act about two years ago, he had duped no fewer than 33 men pretending to be a lady on Instagram and that the least amount he received from any of them was N80, 000. He said, “When I started, much as I pretended to be a lady on phone, some men on the other side didn’t believe me. I then downloaded an app on Google which transformed my voice into that of a lady whenever I am having conversation. “I got several pictures of Shayla, a pretty United States-based lady on my profile. Since then, men have been disturbing me and calling to request a date. “What I do is that I assess people based on their appearance on Instagram, add them and thereafter open up conversations with them before I started bringing up all manners of stories in order to dupe them. “At a point, I lied to most of them that I had an accident and I lost my ATM. I told them that I need some money. Some of them were generous enough to drop money into my account. “I lied to them that I was putting up a boutique and saloon at Ikota, VGC and Lekki, and that I needed money to finish setting up. “I know I made a mistake downloading Shayla’s pictures and used them for fraudulent purposes. I am telling you the truth, those that I have collected money from can’t be more than 33,” Israel added. Confirming the arrest, the Police Public Relations Officer, PPRO, SP Dolapo Badmos, warned Nigerians to be careful on the social media because scammers are on the prowl worldwide. She said, “The suspect’s activities on Instagram was placed under investigations following series of complaints about an Instagram handle @blackberbiedoll, used for criminal activities, which was later traced to him. The PPRO further stated that the suspect has been transferred to State Criminal Investigation Department, SCID for further investigations and would be prosecuted accordingly.